We received more than we gave. 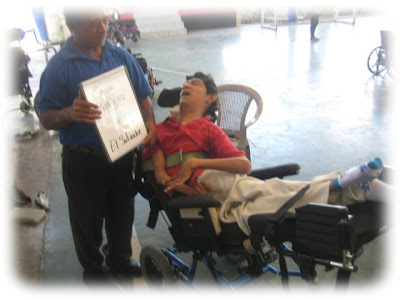 Last December a few of the workers from Hope Haven Guatemala, a small teem from the States and myself headed to El Salvador to do a wheelchair distribution. 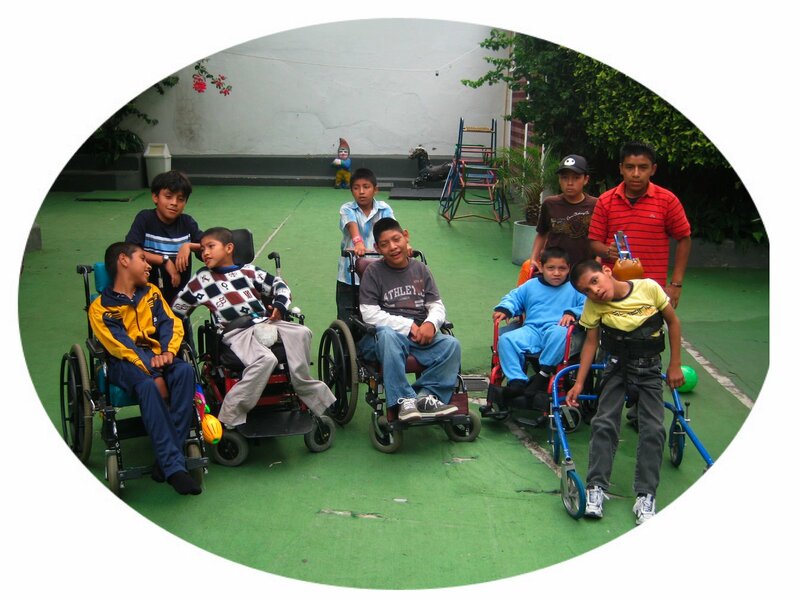 While we were there we teemed up with an organization from El Salvador called Fundacion and gave out well over 100 wheelchairs in 3 days. 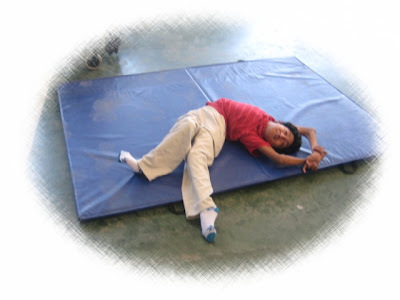 Several of the people that were brought in for wheelchairs were very severe but the young man pictured here had to be one of the most difficult cases that I have ever worked on. 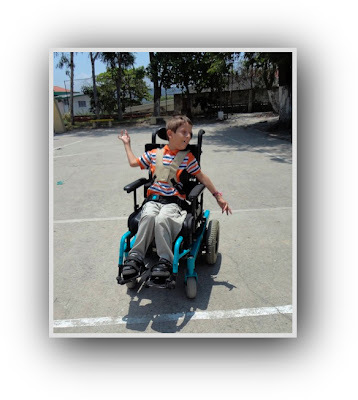 As you can see we had to build and almost crescent shape wheelchair for him but I am happy to say when we were done it fit him perfectly. 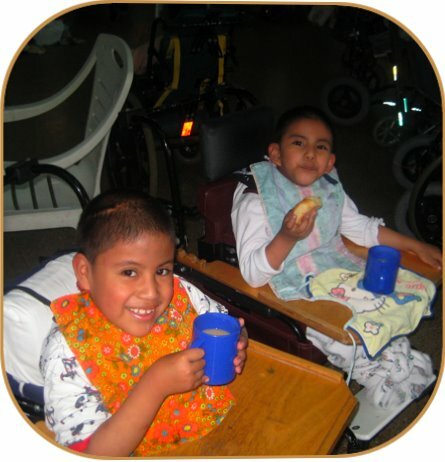 Fact is nearly everyone whet home with a wheelchair that fit them perfectly. 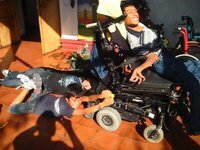 There were 3 kids that I worked with that needed something that we had not brought along though, and that was 3 power wheelchairs. The first day I worked with a 12 year old girl named Gimena. Four years ago Gimena was in a car accident that paralyzed her for life. We were able to put her into a manual wheelchair but Gemena has very limited hand use so there was no way that she could propel it on her own. Gemena told me that she was going to school but even though the school was not far from her home she had to rely on some one to get her there and back home again. She said that she also had to rely on others to get her from class to class. That day I made her a promise that I knew I would have to keep. 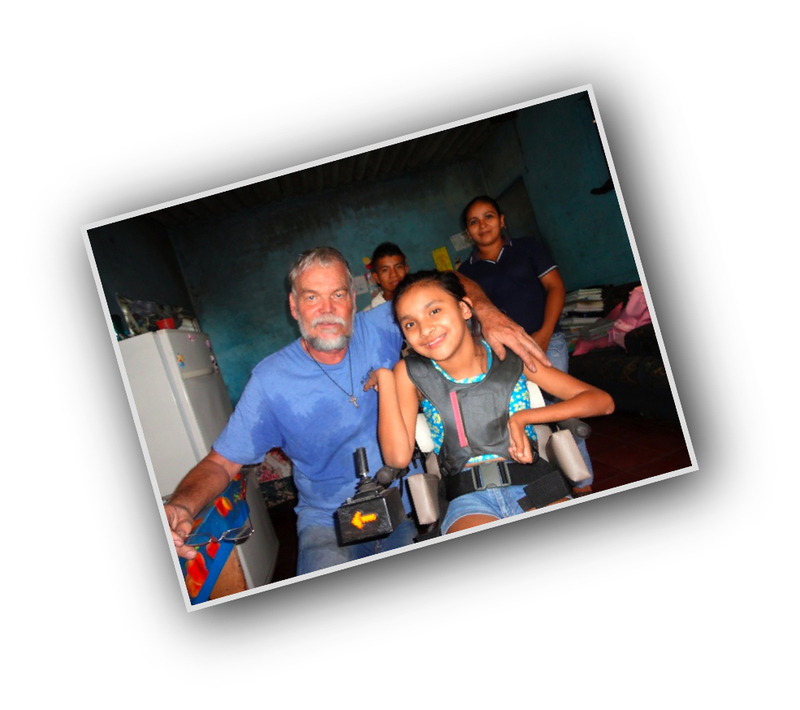 I told her that I would make sure that we would get her a power wheelchair within 6 months. 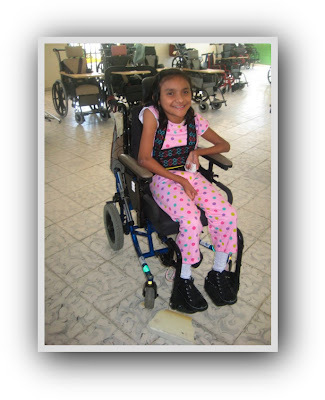 Getting wheelchairs into El Salvador is not an easy task and I knew that some one would have to come down and fit her even if we could get one shipped to her. 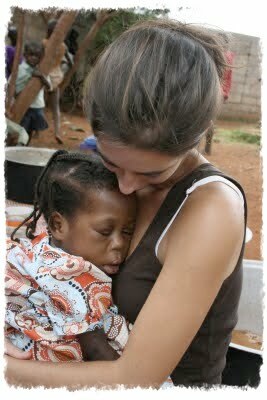 But I also know that Gimena was a determined young lady and that a power wheelchair could change this girl's life. 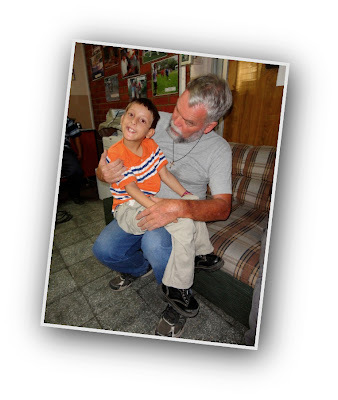 The next day I met a 11 year old boy who had to be one of the saddest people that I have ever run across. 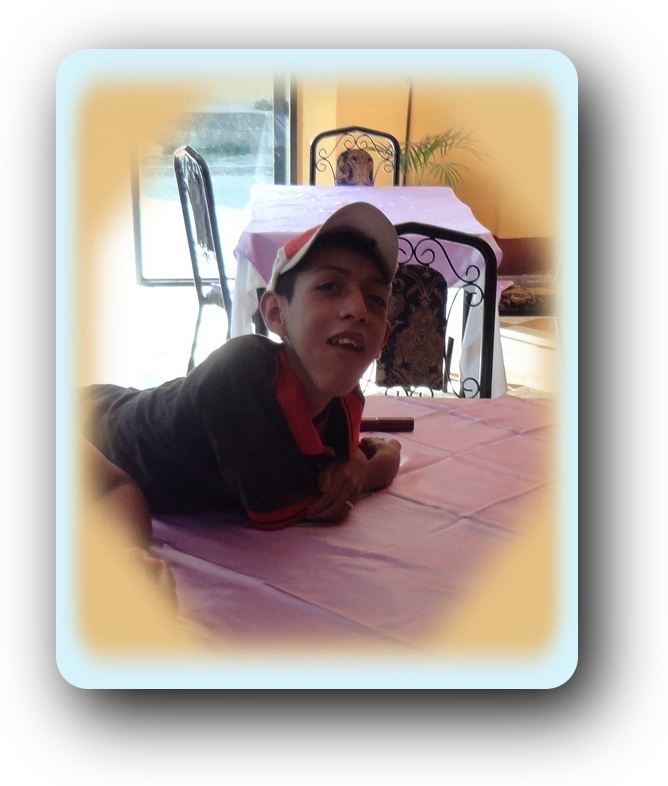 He had Muscular Dystrophy and ever since he became to week to walk he seemed to have lost interest in life. Even after we gave him a manual wheelchair he just sat there expressionless. Not having the strength in his arms to move around on his own he showed little interest in this wheelchair. I then asked him if he had ever seen a power wheelchair but got no response. Never the less I went on to explain what a power wheelchair was and how it operated. There was still not much response but I could tell that he was listening to me. 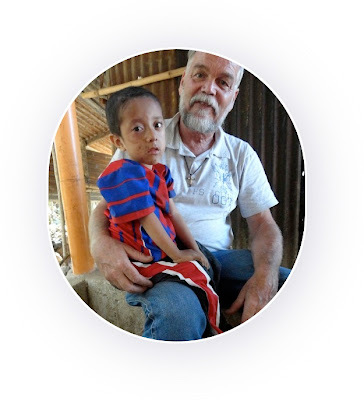 The more that I explained the more he listened, and by the end of our rather one sided conversation I had promised Joel that I would see to it that he would also be receiving a power wheelchair within a few months. 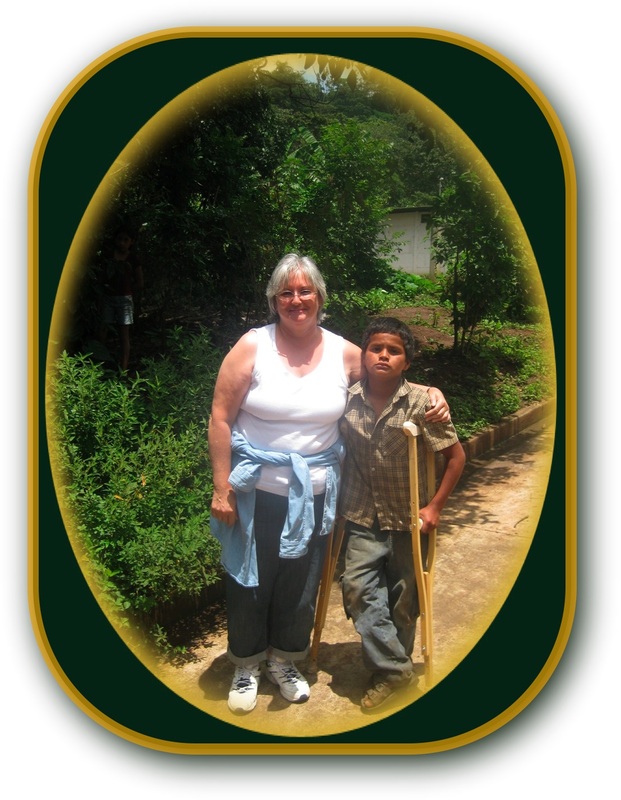 Guess what happened on our third day in El Salvador. Nine year old Bryan reminded me a lot of my friend Stephen who lives back in the USA. 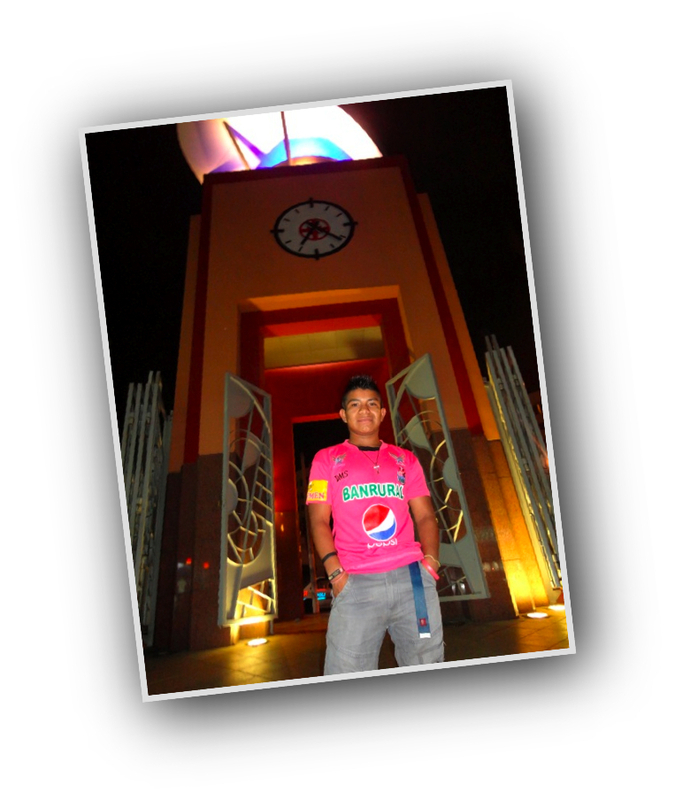 Byran's C.P. is a bit more severe than Stephan's though. He goes to school but can only say a few words and he has very little use of his hands. He is very intelligent though and when I asked him if he wanted a head controlled power wheelchair I received a very positive response. 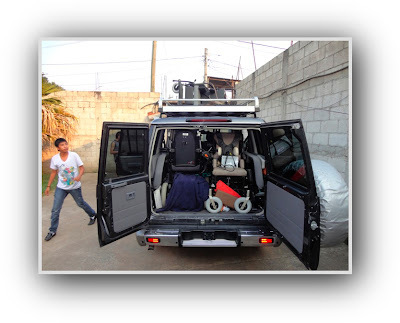 After all I figured that it would not be that much harder to get three power wheelchairs into El Salvador than it would be to get one into the country. 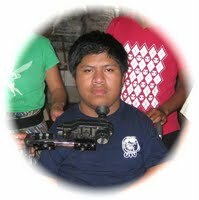 A few weeks later I talked with Alturo and Gustavo who work on the power wheelchairs that come into Bethel Ministries here in Chimaltenango. They told me that they would go to work on setting up three power wheelchairs that would be the exact size that these three kids needed. Chris Mooney who is the director of Bethel Ministries told me that he would look into what paper work would be needed to get these three wheelchairs across the border, and thanks to a donation from my friend Tony who lives in the States I was able to purchase Six new batteries for these three wheelchairs. 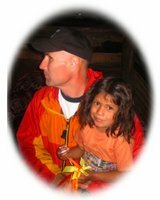 I knew that timing would be an issue because I needed an interpreter to go along to El Salvador with me. Pat could not go because she had other commitments, (One of which is her new group home which I will try to talk about later in this journal.) If I took any of my boys along they would have to be at least 18 years old and have the necessary paper work to cross the border. This narrowed it down to Calin or Cessar. I would have gladly taken both but Calin had promised Pat that he would help her out during the week before Easter which was the only days that he had off from School. Cessar however was free during that week and said that he would love to go. So last Sunday March 24 Cessar headed out on a five day adventurer. 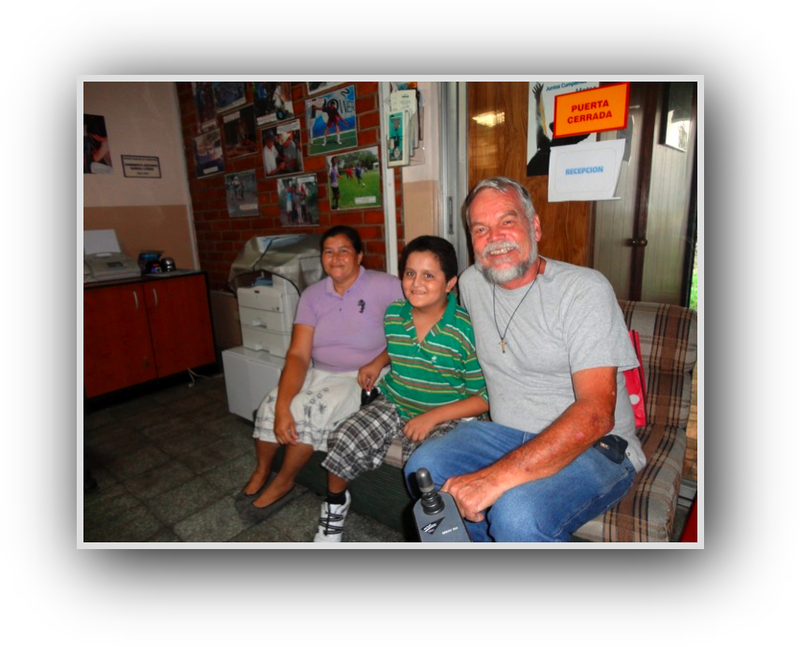 When we reached Santa Rosa, which is still in Guatemala, we stopped off at the home of a boy that I had met in Antigua several months ago. He could not walk and had no Wheelchair so his mother had to carry him around where eve he went. This was not an easy task as he was rather heavy. 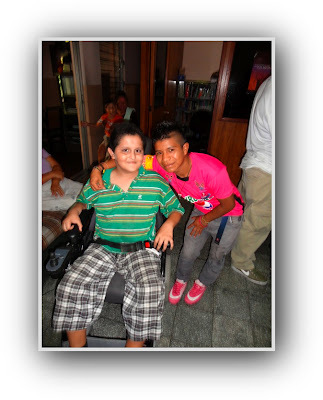 As well as the three power wheelchairs that were snugly fit inside of my car, Cessar and I had also strapped a Hope Haven Manual wheelchair onto the roof of my car and this was the boy that we planned on giving it to. 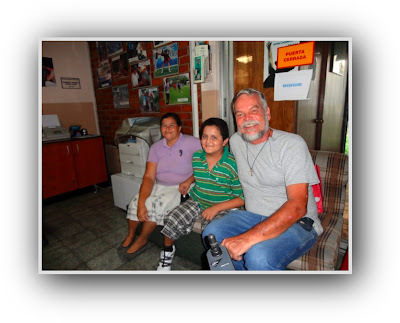 All I can say is if the other three children that would be receiving wheelchairs would be half as happy to receive their wheelchairs as this young man was it was going to be a neat trip. We had arranged for Mario who worked at Fundacion, the organization from El Salvador that we had done the December wheelchair distribution with, to meet us at the border at 9 AM on Monday morning. Even though Carlos had given us some paper work we knew from previous experiences that there would be a lot more paper work to do at the border and that duty would have to be paid and the process could take several hours. There was one problem, when I reached the border. I could not fined my passport. I knew that I had placed it in a small compartment of my computer bag but it was not there. I went through the bag several times but no passport. After praying for wisdom and calmness, neither of which I seemed to have at the time, I looked one more time through my belongings. There it was right in the compartment that I knew I had put it in. How I had missed seeing it the first few times that I looked for it is beyond me. We sill had not seen Mario and I could not reach him on my cell phone but I managed to hook up to Skype on my computer, only to discover that he and two other men had been on opposite side of the same building we were at for the past half hour. Now for the fun part of seeing if we could get the three wheelchairs across the border. 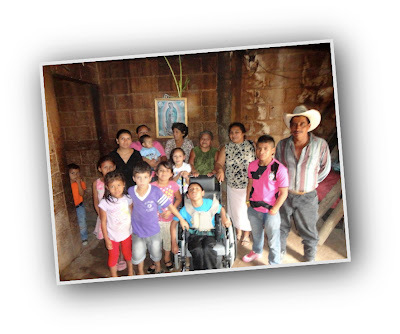 I had been told by a number of people that they would be praying for us before we left and I had specifically mentioned that I was worried about getting the wheelchairs across the border. Would you believe that in less than 15 minutes we were on our way and that the customs agent told us that we did not have to pay anything. "OH ME OF LITTLE FAITH"
About an hour and a half later we were in San Salvador. After checking into our motel we drove to the home of Gimena the girl that had been paralyzed in a car accident. To our amazement Gimena's home was located up a steep flight of stares but mom quickly told us that the family would be moving in less than a week. 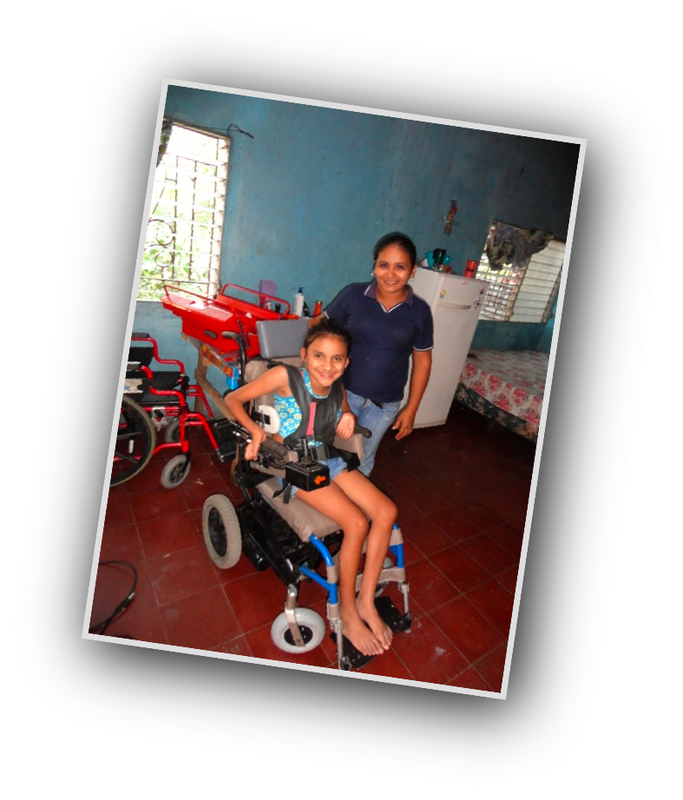 She also shared with us that when Mario phoned a few days earlier telling that family that Gimena's power wheelchair was on it's way Gimena started to cry. 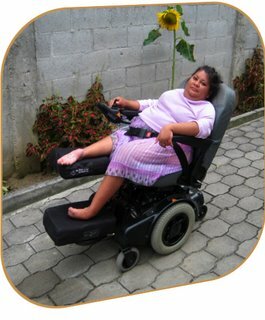 Mom said that these were tears of joy and that Gimena had been praying that she would actually receive a power wheelchiar ever since I told her about it over three months ago. Since Gimena had very limited hand movement and a curved spine it took Cessar and I quite a while to get the chair set up, but once we did there was no stopping her. I could not help but chuckle when we asked the family to line up for a picture. 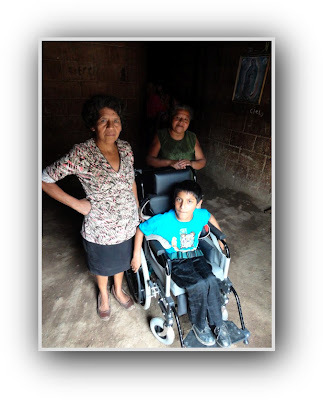 When mom took hold of the power chair to place her daughter into position for the picture Gimena quickly told her that she could do it her self, mom looked up at me as if to say, "This is going to take some getting use to." After all this was the first time in four years that her daughter had been able to do anything on her own. When Mom went to thank us, Cessar explained to the family that this chair was a gift from God and that He was to receive all of the praise. It was nearly 5 PM when we had finished so Cessar and I headed back to our motel. After getting cleaned up (We needed that as the temperature had to be in the mid to upper nineties.) we decided to walk to a nearby shopping mall and get some supper and perhaps take in a movie. The Subway food was great but there were not any good movies playing so after exploring the mall a bit we headed back to the motel. On Tuesday Cessar and I went over to the center where Mario works. He had arranged for the other families to come there for their chairs. 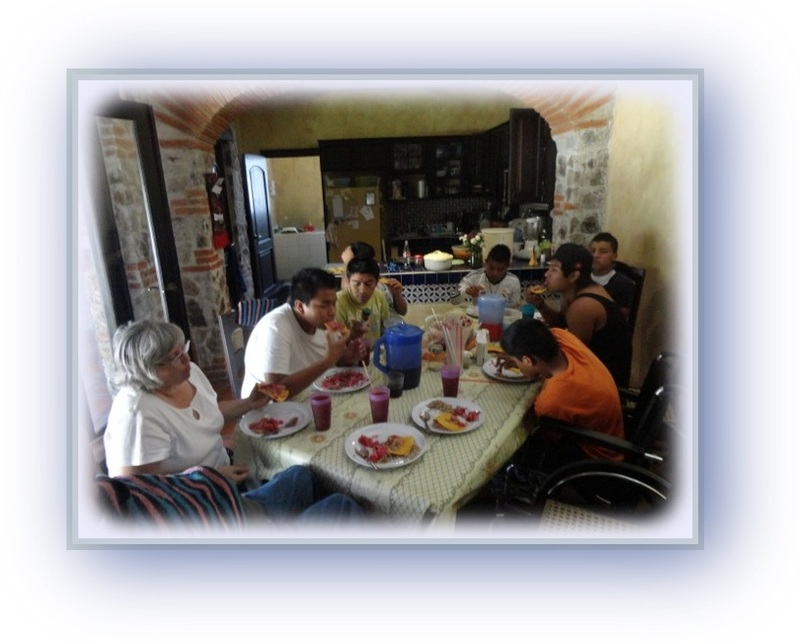 When we arrived we found that one of the families was already there waiting for us. 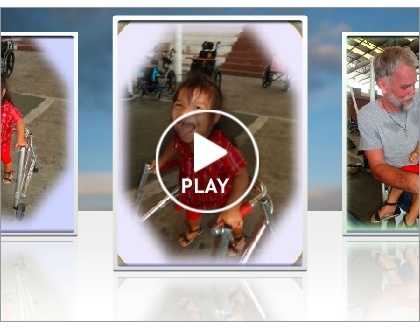 This was the family of the Boy that had muscular dystrophy. I could not believe that this was the same boy. 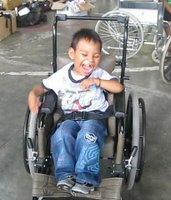 Today he was talkative and smiled a lot, especially once he saw his new power wheelchair. It was not long before this young man was racing up and down the halls of the center. All I can say is that so far any one of the three people that we had brought wheelchairs to was well worth the effort. Brian, our last little boy was one kid that I had really been looking forward to seating. I knew that he would be the most difficult case because his body was severely contorted and his limbs were in continual movement. Just when I thought that no one could be more excited about receiving a wheelchair than the last few kids that we gave wheelchairs to I was proven wrong. The last two kids that were given power chairs had at least been given manual wheelchairs when we were here last December. 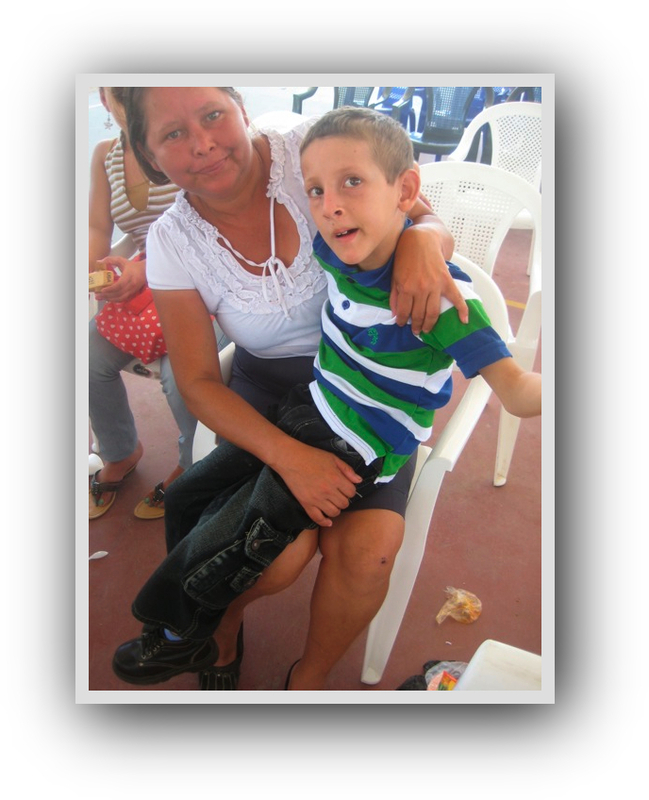 In December Bryan had shown up the day of our last distribution and by the time we got to him there were no specialty chairs left that would fit him. That is one of the reasons that I know that I had to come back. On that day I was not entirely sure that a power chair would work for him but seeing the determination in his eyes I know that we had to try. He reminded me so much of Stephen that I could not help but think back nearly 20 years to when I had started working with him. Stephen not only learned how to drive a power chair but became an expert on the computer. He even learned how to fly my airplane. (With me along of course.) 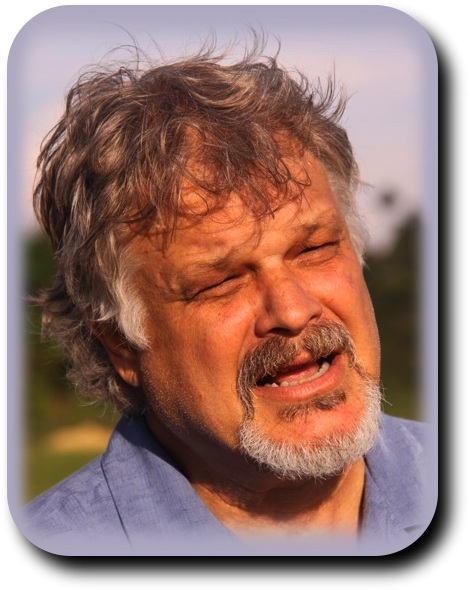 I do remember the day his mom showed up on my yard unexpectedly and was a bit shocked to see her son driving across the field with my pickup truck, towing a tree that I had fallen. Some how it did not seem to make her feel any better when I told her that she did not have to worry about him getting out on to the road because there were ditches on all sides of the field. 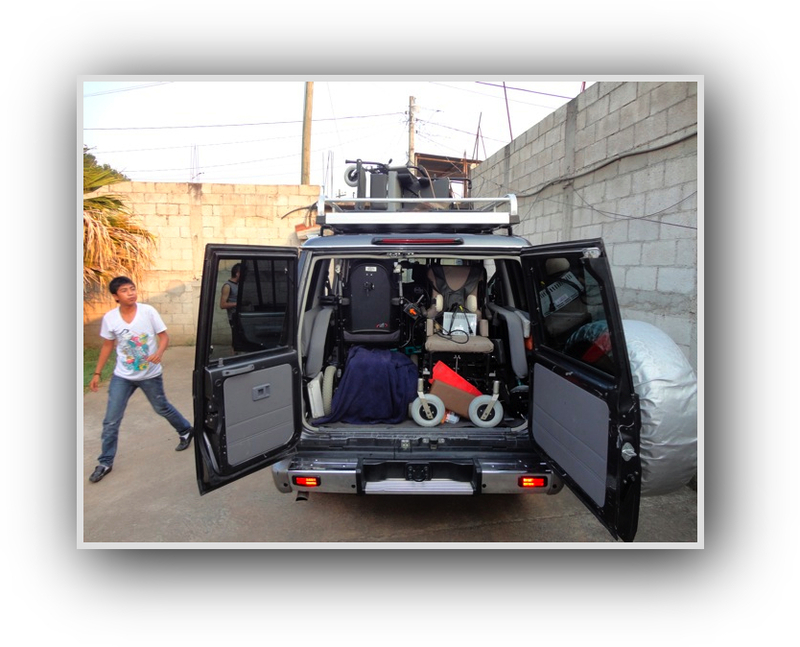 As we had figured it was a real challenge getting Bryan fitted into the wheelchair and things adjusted so that he could use the head controller but after a few hours it was time for his first test drive. His first few attempts were a bit shaky but he was doing it. I think that one of the problems was that his smile was blocking his vision. He was having a great time and Mario didn't seem too upset about the scratches on his desk and walls. We decided though that it would be a good idea to take him to a nearby park where he would have a bit more room. Once we got there he relaxed a bit and did much better. What a neat kid. What a neat family. They promised that they would continue to work with him and I have little doubt that he will soon be driving like a pro. Cessar and I then went back to the motel. We were an hour past check out time but seeing how hot and sweaty we were the owner of the hotel took pity on us and let us shower before checking out. I have no El Salvador map on my GPS so before saying goodbye to Mario he gave us directions to the coast which was about an hour and a half away. He showed us which road to get on and told us to continue straight and there was no way we could miss it. After all how can you miss an ocean? About two and a half hours later we stopped at a gas station to ask for directions. We were told that the ocean was now two hours away and they drew us a map that made no sense at all. We tried to follow the map for a little while once we got out of the Gas station though we decided that if we headed south west we would have to find it some day. The drive was beautiful and we only had to turn back once when the dirt road that we were on ended but we finally made it. I do not think that this was exactly the place that Mario had in mind and I am fairly confident that the people there had not seen many Americans before, but it was getting late so we decided to find a motel and see more of the ocean in the morning. We found a lady that did not look too intimidating and asked her if she knew of a good motel. 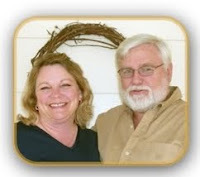 She told us that she only knew of one motel in the area but she did not use the word good when she described it. She was right. It had 2 beds like we had asked for but the room was so small that you had to crawl across one bed to get to the next and pray that you didn't get bitten by any spiders or other critters on your way there. It had a bathroom, (Well sort of) if you want to call toilet on the far side of the second bed a bathroom. We told the manager that we felt that $10 was to much to pay. He told us that he would negotiate but I could not get him to pay us $10 for staying there so we left. A bit further down the road we saw a sign that said motel. When we drove into the entrance all we saw was what appeared to be a junk yard with a bunch of old trucks in it but sure enough over to one side was a restaurant and hotel. It was nothing to write home about but we were able to walk to our beds and the bathroom had a wall between it and the beds. There was an old swimming pool out back but I think that they used it to drain the oil from the trucks that they worked on. 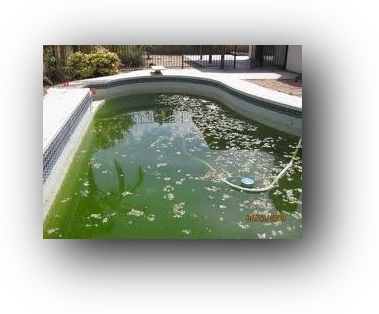 Fact is Cessar refused to swim in it. I hate swimming by myself but it was hot out. Don't worry I showered afterwords. I am not sure where the water for the shower came from though. The next morning we went to the beach and then headed back to the border. Not too much problem at the border. Note to self Next time remember that you are suppose to stop and check in at the El Salvador side of the border as well as the Guatemala side. Rule # 282 Making a U-turn in the middle of a narrow bridge over the river that separates El Salvador and Guatemala can be a real chore. Rule # 283 Making a U-turn in the middle of the narrow bridge over the river that separates El Salvador and Guatemala is a good idea when told to do so by 5 armed poliece even if it is a real chore. 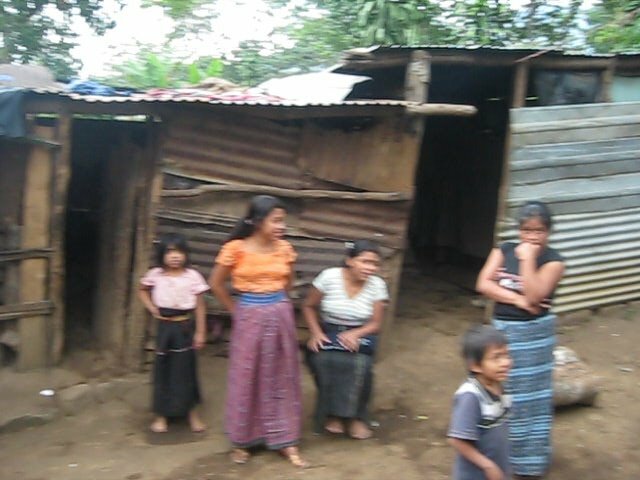 We considered trying to make it home but decided to check in on a few kids that are sponsored through Bethel Ministries. Our first stop was at the home of Bryan and Oliver. We were told that the boys were out with their grandmother and that they would not be back for an hour or two. We told the people that were at the house that we would come back later and then went about an hour up the road to the home of Wilmer and Walter. 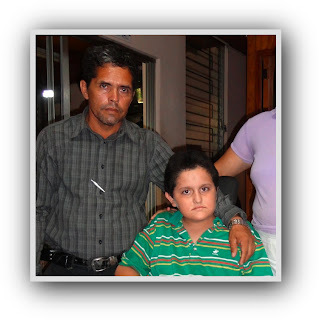 Wilmer had the same sponsor for several years and even though he is getting weaker he still enjoys his studies. 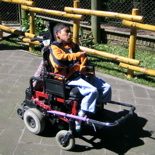 Wilmer's younger brother Walter seem to have the same thing as Wilmer because he can not walk either. I have a feeling it is something genetic because both boys have the same elongated heads. Both boys are very intelligent though. 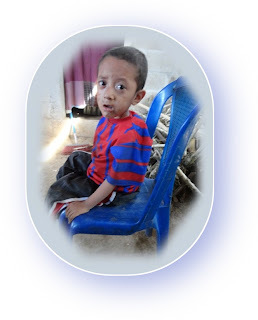 I have an idea that Walter will need a sponsor next year as he is five years old now and since he cannot walk he will likely not be allowed in the public school. 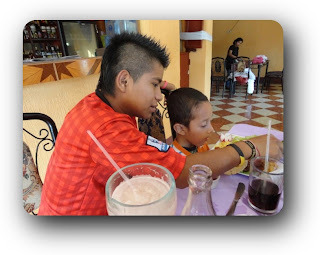 While we were there mom reminded me that I had promised the boys that the next time I came and visited I would take them to Camperos. 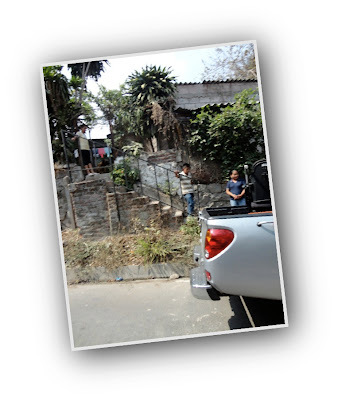 The only problem was that it was nearly 4:00 PM and the nearest Camperos was nearly an hour from their home. A promise is a promise though but we did compromise and settle for a small restaurant that was located in the nearest town which was less than 15 minutes from where they lived. Walter is getting so week that he can no longer hold his head up when he sits and is only comfortable when he is lying on a table with his knees down on a chair. I do not know how long he will live but did promise him that I would do my best to get him a power wheelchair. Walter actually looked like he was a bit healthier than he did when I saw him a year ago. Two years ago Pat and I brought him to a specialist and we were told that there was not much that could be done for him. After we brought Wilmer, Walter and their mom back home we headed back to where Bryan, Edgar and Oliver lived. They were now at home and were happy to see us. They quickly reminded us that I had promised to take them to Camperos if they had done well in school. At this point I was getting tired enough that I was almost wishing that they had not done well in school so that we could call it a night and head to our motel (Just kidding). Fifteen minutes later the six of us were at Camperos. How three kids plus Cessar and myself ended up being six people I will never understand but that is how many there were and our extra kid seemed to enjoy the pizza as much as the rest of the crew. After bringing the 4 of them home Cessar and I headed to our motel and crashed. The next morning we headed for home making just one more stop before getting there. We stopped off to see Pat and most of my boys. A good number of the my kids have been spending the past few days with Pat. 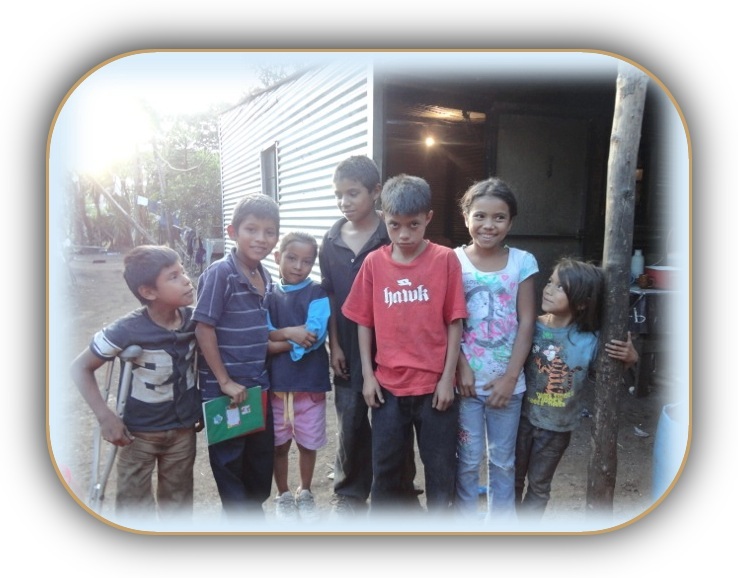 Normally just Cessar and Fernando live there during the week because they now go to school in Antigua. However this week Pat is making a test run by having three of the people that normally live at Hermano Pedro stay with her and a number of my boys are helping out. Calin and Miguel are actually working for her, but Alex and Esben went to her place a few days ago to do some cleaning and painting and were enjoying them selves so much that they asked if they could stay for a few days. 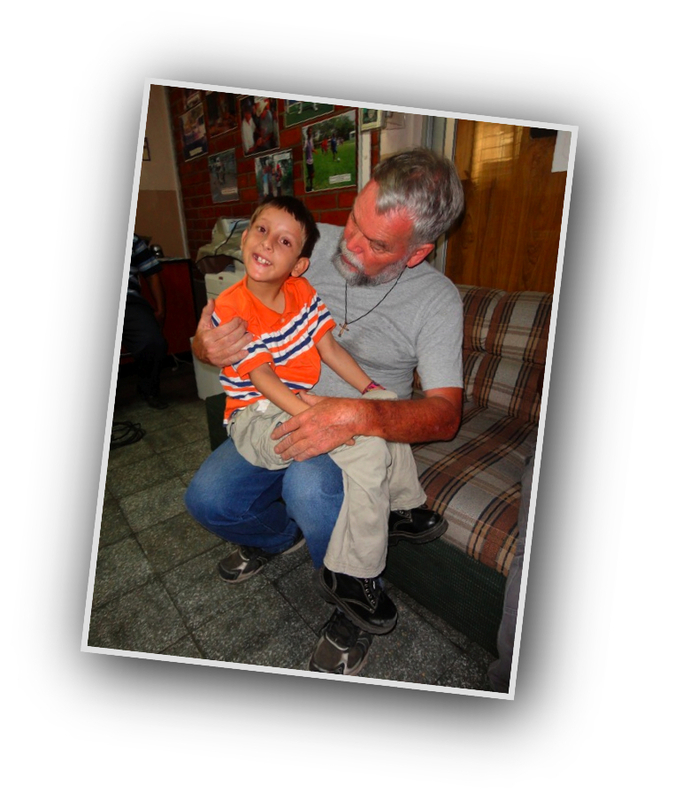 Fernando had gone back to Chimaltenango for a few days but must have heard about how much fun they were all having because he had found his way back to Pat's as well. When Cessar and I walked into the house the entire crew was baking cookies. I think that this group home is going to be a real success. I asked Pat if she was being over worked but she told me that the boys were helping out so well that she was actually enjoying herself. I did take some of them home with me though and within an hour I once again had about 10 kids in my house. I though about calling her and asking if she wanted a few of them back but for the most part enjoyed seeing them all again. When I started writing about this week's activities I fully intended on following up by sharing what went on this entire month but can now see that that this has become a novel. I think that I will simply post some pictures and let you fill in most of the words. I will say one thing though. 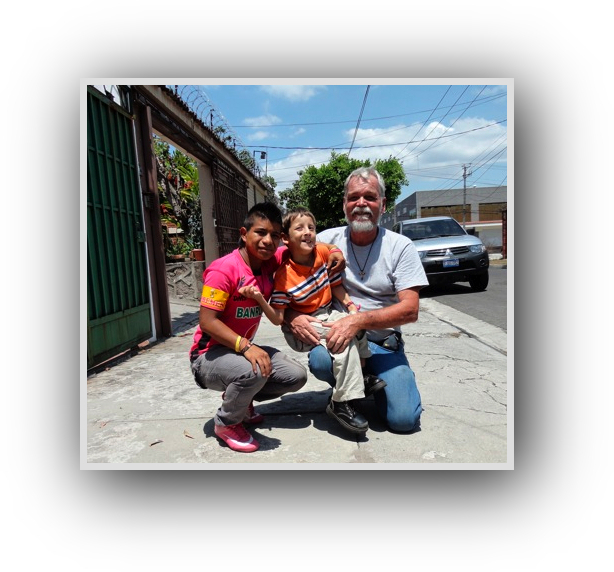 We have really been seeing God at work here in Guatemala. In just two Bethel distributions alone we have seen 40 people come to know the Lord. in the rest of this journal that I have not written.